When Paula Winchester Hisel posted this challenge it really made me think. I remembered all the wonderful summers we spent in Charleston S.C., Myrtle Beach and Savannah. All the summers have become one memory in my mind. One beautiful memory. 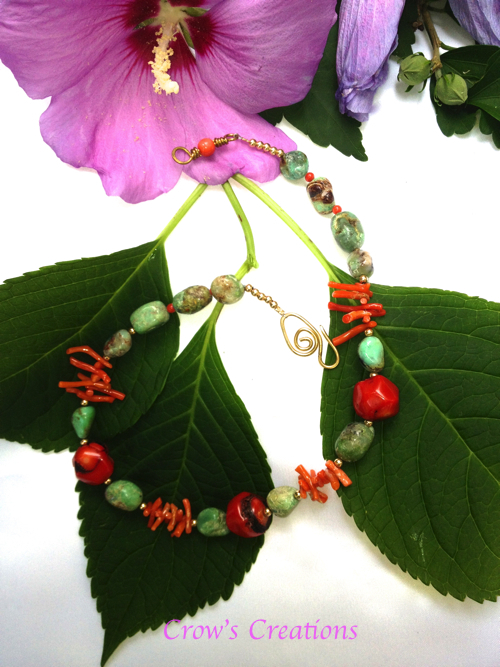 To recreate my memory I used chrysoprase and vintage stick coral. I added a few pieces of bamboo coral and 14K gold beads and a handmade clasp. I can feel the breeze in my hair and the sweet smell of the summer flowers. Thanks for the memories. I miss you Mom and Dad. ← ZnetShows, Inc. cultured sea glass conch shell beads. This is really pretty, love your color scheme.